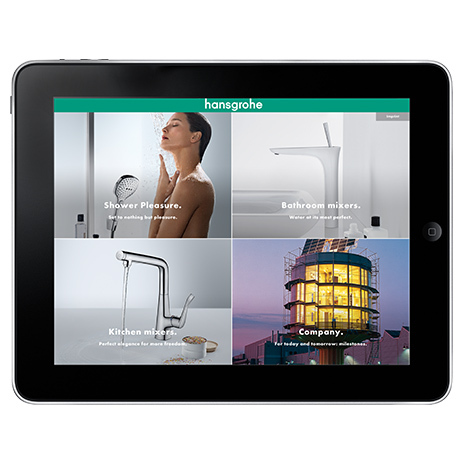 You and your customers can use the hansgrohe Showroom App for the iPad to check out every aspect of hansgrohe. Use this fun tool for your sales discussions. The app can be downloaded free of charge. 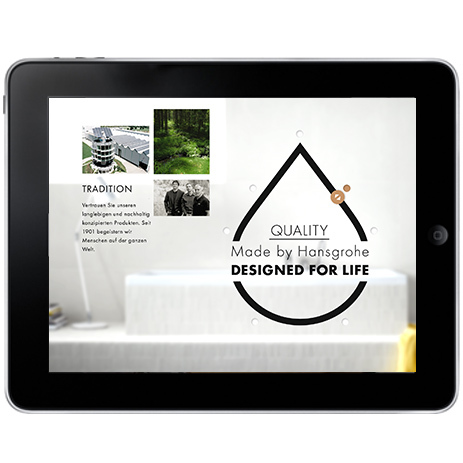 It contains interactive applications and video clips which portray water in a completely novel way. Showering fun in all its dimensions. Show your customers personalised shower solutions – from a range that includes modern hand showers, elegant showerpipes and even fabulous overhead showers. Introduce them to a variety of different jet types and convenient shower control systems, which are flush-mounted to save space, for example. 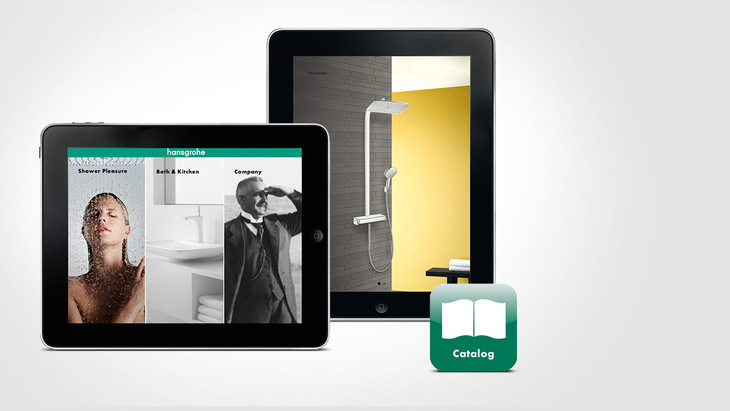 Check out hansgrohe's top innovations together: Select provides an enjoyable experience at the touch of a button, while AirPower mixes up the shower water with air. Bathroom mixers – perfect in form and function. Are your customers looking for the right mixer for their wash basin? We can help. 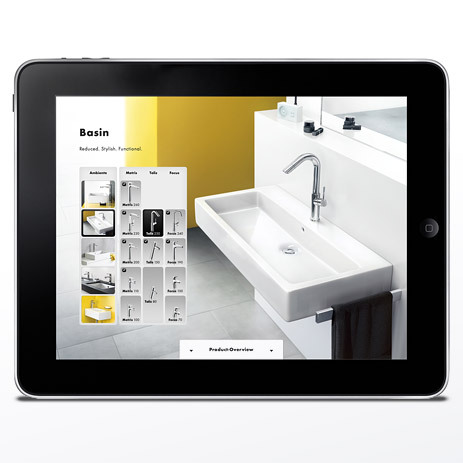 Are your customers looking to completely redesign their wash basin? 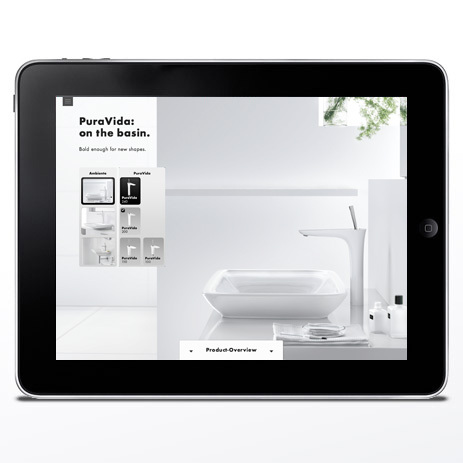 The app showcases our wide variety of mixer ranges, and a Configurator determines the ideal wash basin and mixer combinations. 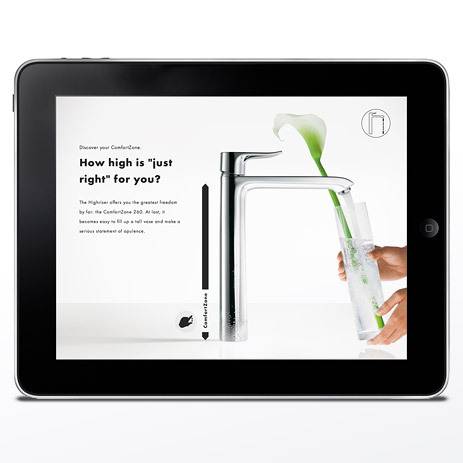 Your customers can even test out various heights themselves – to enjoy more space in the bathroom. Products that offer showering indulgence for vegetables too. Use the app to actively check out our range of kitchen mixers too. The ultimate in comfort. Featuring a variety of designs, adjustable hand sprays, water function at the touch of a button, convenient heights or swivel ranges. Guaranteeing more indulgence in the kitchen. What would this shower or that mixer look like in your customer's home? You can demonstrate this with realistic simulation: using your iPad's camera function. The products that your customer is interested in can therefore easily be projected into the ambience of his own bathroom or kitchen. There is a notepad for favourites, which can be e-mailed or printed out. 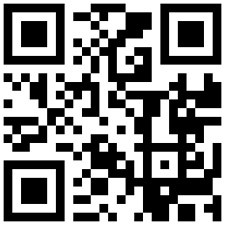 Direct link to the app in iTunes: just scan the QR code with your iPad.